An overnight snow is continuing in most part of northeast China region on Saturday, bringing down temperatures and forcing airports and highways to close. 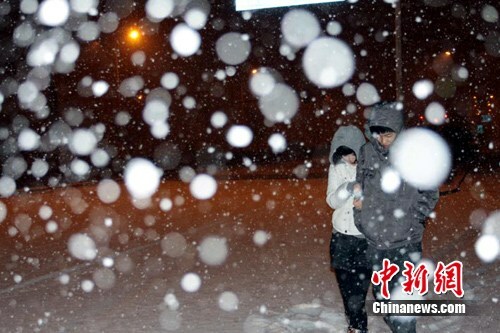 An overnight snow is continuing in most part of northeast China region on Saturday. An airport in Changchun, capital of Jilin Province, was closed twice before 9:00 a.m. Saturday, because of occasional blizzards, with at least 13 flights being canceled. But the airport authority said the runway has been reopened despite snowing, but it could be closed at any time if the snow gets heavier. The weather bureau in Harbin, capital of Heilongjiang Province neighboring Jilin, forecast the the lowest temperature would fall below minus 20 degrees Celsius on Monday. The transport authorities said all major highways in the northeastern region have been closed amid the widespread snow weather. The Beijing Meteorological Station said the lowest temperature on Saturday would drop to minus six degrees Celsius in the urban area, and minus 10 degrees Celsius in the outskirts, making Saturday the coldest day since the beginning of winter. Zhang Mingying, a senior engineer with the station, said the cold air dispelling dust and haze in the previous days would not bring along with snow as the humidity was low, and the temperature would climb up again in the next week.